The following video pertains to the "Amen Break," a ubiquitous drum sample from 1969 that has subsequently been used in hip hop, jungle, drum n' bass and even commercials. The break was taken from the song "Amen Brother" by the Winstons, which was the B side of their hit record "Color Him Father." The video below not only details the history of the Amen break and its subsequent usage, but also contains great background information about sampling and the legal evolution thereof. Check out the video, and as you listen to today's music, be on guard for the "Amen Break"! Special thanks to Jamie "Funktual" Freund who originally shared this video with me. Funktual is an expert on hip hop samples and has recorded 43 amazing volumes of Youtube videos that reveal original funk records and the hip hop artists who subsequently sampled them. For more info, visit Funktual's Youtube site or website. 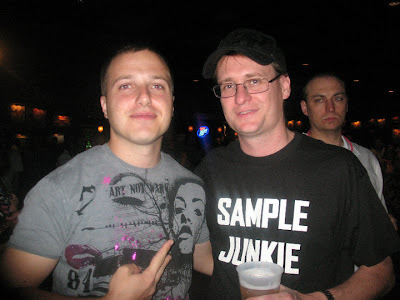 And finally, check out DJ Funktual's distinctive "Sample Junkie" tee-shirts, as modeled by yours truly! The back of the shirt contains a list of records. If interested in ordering your own, contact funktual@live.com. DJ Jesse Lambros (L) and DJ Jagged (R), enjoying the 2010 DJ Times International DJ Expo in Atlantic City. Sample Junkie tee-shirt provided by DJ Funktual, and is a great conversation starter! Joey Fatone (from N' Sync) saw me in the hall and addressed me as "Sample Junkie"! Is an iPod Wedding Reception a Good Idea?